VERT ATTACK 5 – the (european) Resurrection of Vert! 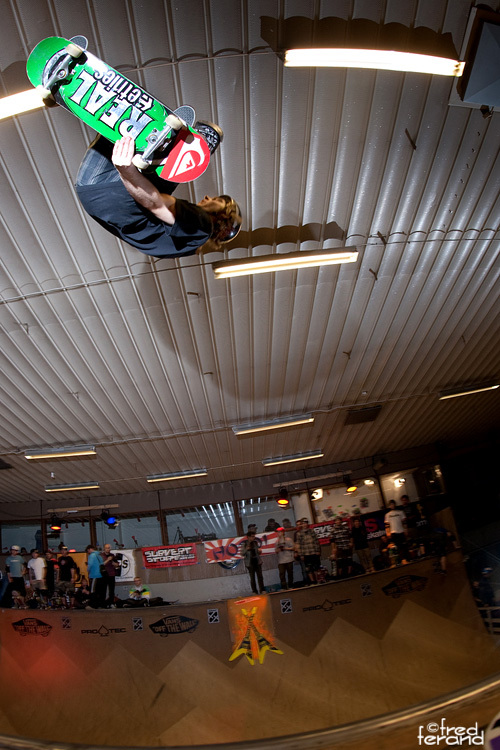 VERT ATTACK 5 was one hell of a contest at the huge vert skater gathering in Malmö, Sweden. VERT IS BACK! After the fifth edition of the “European Midvert Championships” it’s getting ridiculous to deny this. 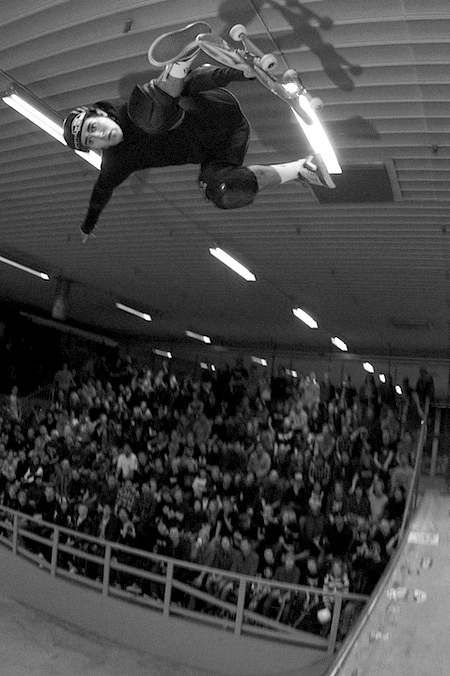 That was already the case even after last winter’s Vert Attack 4, when 67 european vert skaters had celebrated an incredible day of vert at its best. 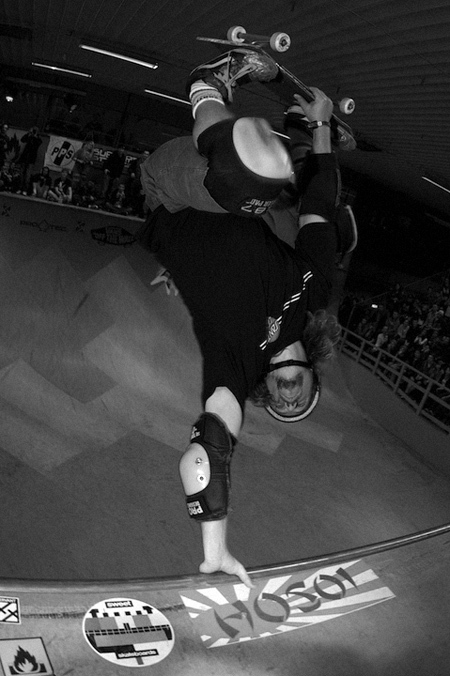 Andy Scott killed it last time, worth to watch it again and again on vimeo.com. And he did it strictly based on lip tricks, so many, wall-to-wall. Almost everyone came back this year. And everyone made promotion for VA5 among their friends. It started with Jeff Hedges, confirming american legends were confirmed for this comp as well. 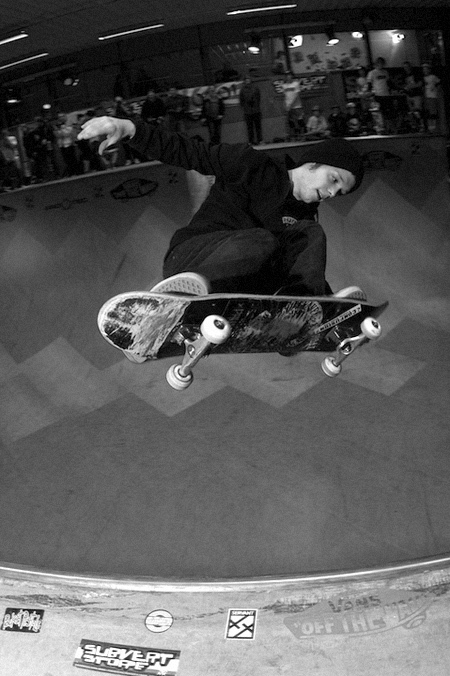 Cab and Hosoi followed. Neal Hendrix had already confirmed, followed by Alex Perelson. Sounds like a huge event with the biggest financial support by a major sponsor, but hardly any money was involved – the main sponsor was again the city of Malmö! No prize money was needed to attract the scene. It was a troop of vert warriors and veterans, hitting the drums for the Vert Attack via facebook and other new social medias. 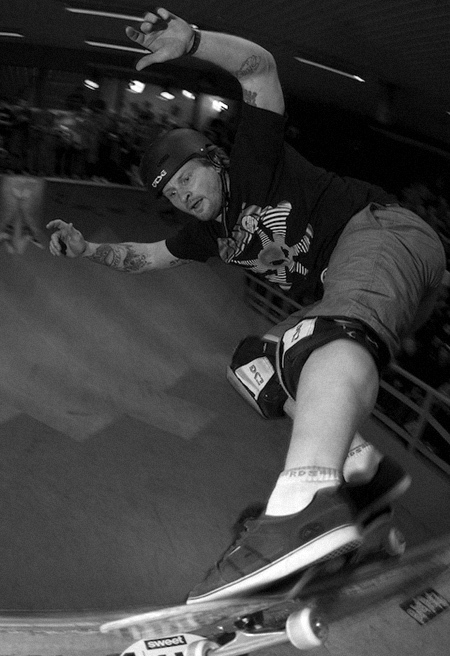 The tension grew larger each day as skaters posted about Vert Attack. The latest confirmation, a day before the comp was that Rune Glifberg would also be showing up! Rune is from Copenhagen, Denmark, just a bridge away from Malmö. But he has lived in the USA for almost two decades and hadn’t shown up for the first five years of the event. 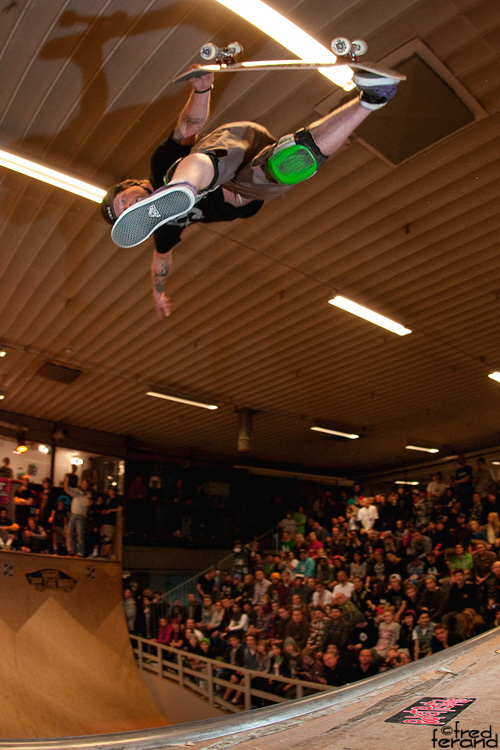 In 2010 for Vert Attack 4, the time was already tight to let 67 vert riders compete in only one day. How many would come this year? Over 100 competitors seemed possible, especially after the US-Masters had confirmed. 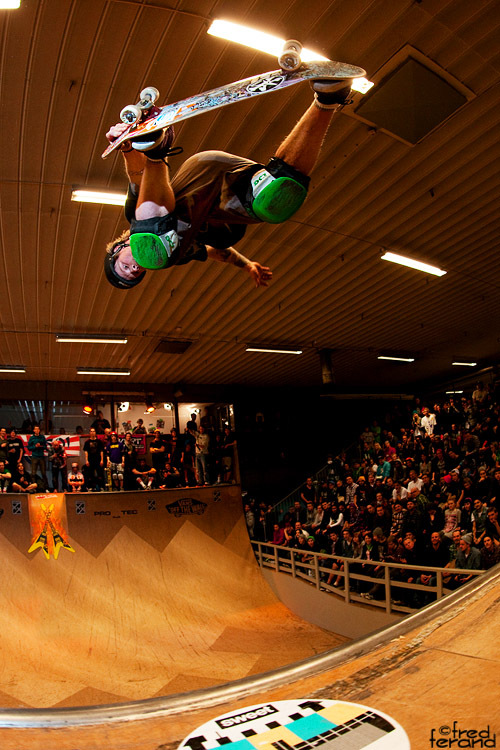 Hard to say how many vert riders there were among the crowd… luckily the number of competitors stayed manageable. 16 young guns, 51 pros and ams, and 20 masters (over 40 years). A total of 87! 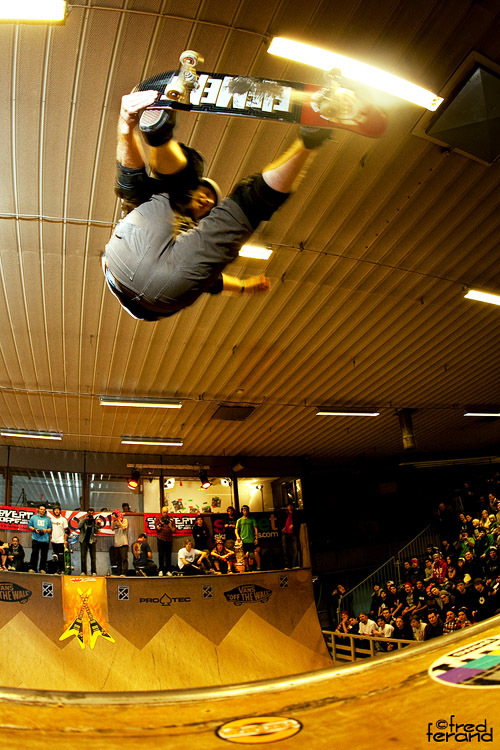 Never before in europe had such a big vert comp gone down! At this point one name should get dropped for the first time in this report: John Magnusson. The VERT ATTACK is his master piece. 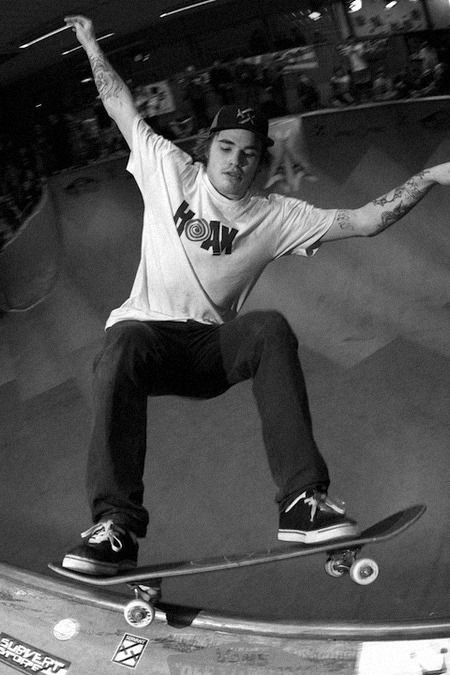 He is an all round skater with biggest skills in bowl and vert. 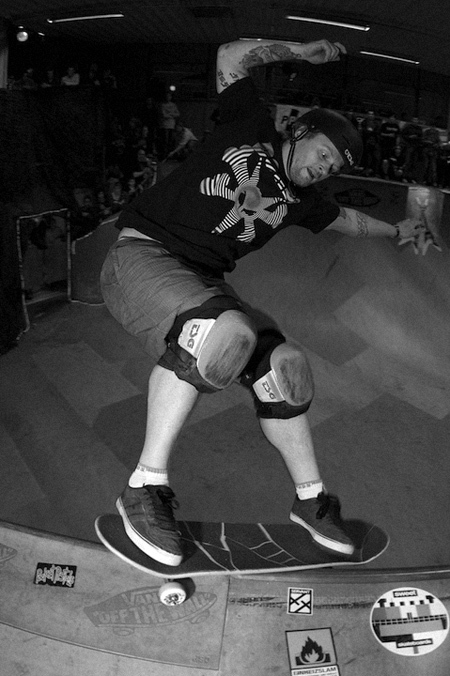 Besides running his own skate companies he works for Bryggeriet, the skateboard club of Malmö, to which the skatepark where VERT ATTACK took off belongs. 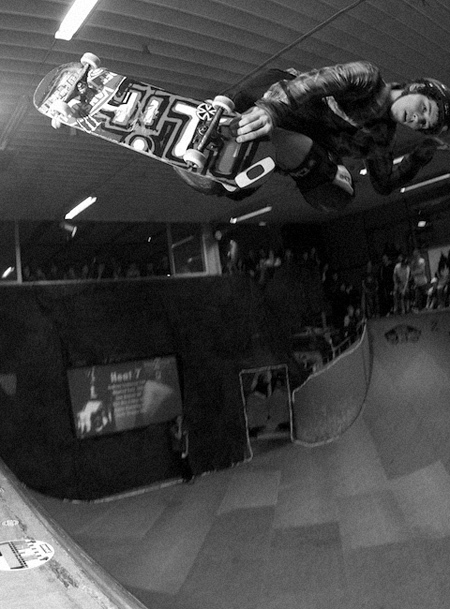 In the past decade he’s been working really hard to get Malmö on the map with new skateparks and events. 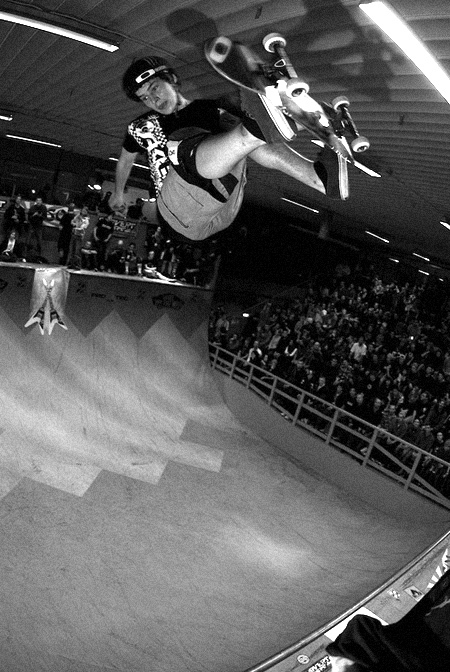 He brought Quiksilver Bowlriders to Malmö and organizes the Malmö ULTRA BOWL, which last time was dominated by US-rippers from Bacon, Addikt and Powell. Cab, Hosoi and Ffej visited a classroom of the school and were impressed by their standards. Scandinavia, especially Sweden, is well known for high standards in education and youth work. 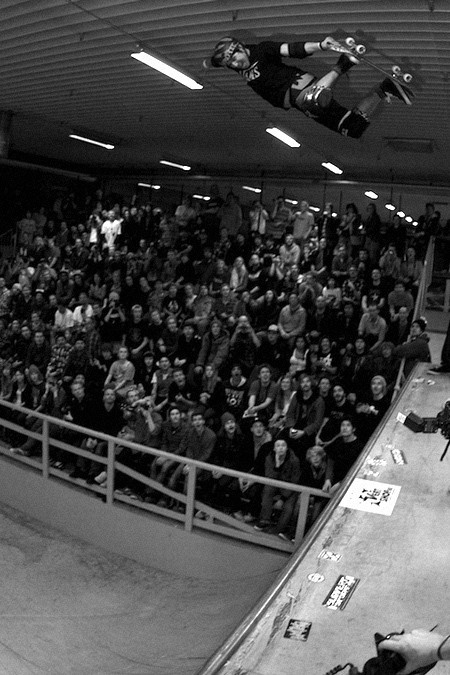 Like every year the one and only skatedoc Patrik Bergholtz made the introduction of the event – on his guitar! Lights off, spotlight on, and Patrick played the guitar hero with his own vert attack song! The youngsters were the first to go. Rippers from four different nations made it to the final: Germany, Norway, Sweden and United Kingdom. 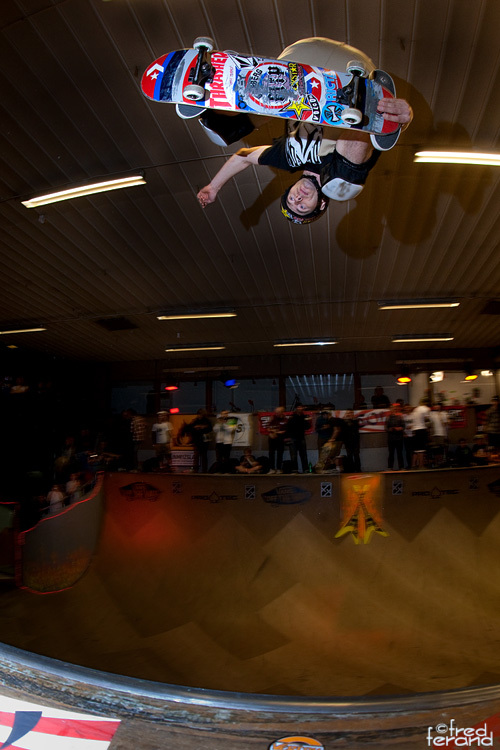 The 13 year young Mathew Carlisle from UK won the juniors, with Frontside Rodeos and gaytwists at coping height or backside 180 varials over the channel! Pros and Ams still competed together in one group. (In 2010 there was no separation at all: all competitors joined well mixed heats!) The biggest contenders were last years winners Andy Scott (in 2010), Sam Bosworth (4th in 2010), Sam Beckett (5th) from UK and Jussi Korhonen (2nd) from Finland, next to “newcomers“ Alex Perelson, Neal Hendrix, Rune Glifberg and Adil Dyani. Adil now lives in Norway again, after many years in California, which had improved his skills a lot. 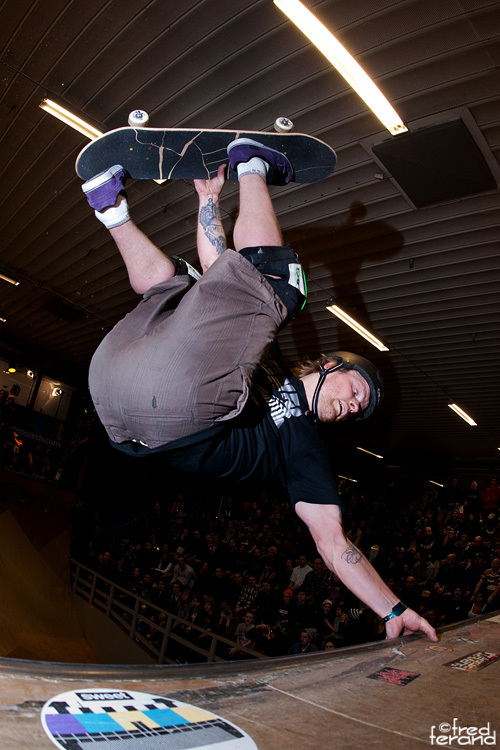 There are more names to mention, talking about a top european vert comp: Oskar Gydell, Mattias Svensson, Jocke Olsson, Stephen White and Macki “Vertboy” from Sweden, Alex Halford and Jake Anderson from UK, Thomas Madsen from Denmark, Jon Pedersen from Norway, and local Mattias Nylen played major roles in last years’ Vert Attacks. Most of them didn’t make it to the finals this year. But who did was the second youngest pro/am competitor, Jake Anderson from England. Ever heard of this guy?? I had seen him at VA4 for the first time, but did not think of him again until this year. One thing to keep in mind from now on is that he became a father last August! At the age of 16! I was told he rips much harder since his son was born. At Vert Attack 5 he proved that, especially with his amazing last run, adding spin and twist airs wall to wall as if he’d be Andy Mac Jr.! 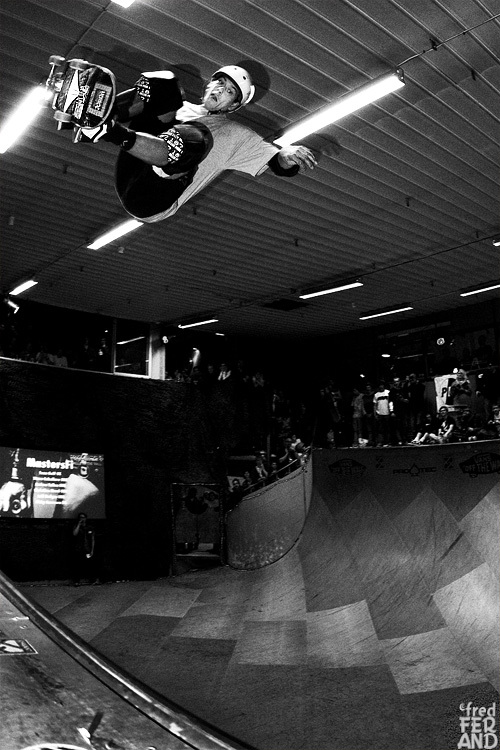 How incredible that this “unknown father kid“ could beat the whole european vert elite, Alex Perelson and Rune Glifberg, who were also ripping like hell!!! The pro final was rad, but the masters final was more important to me. 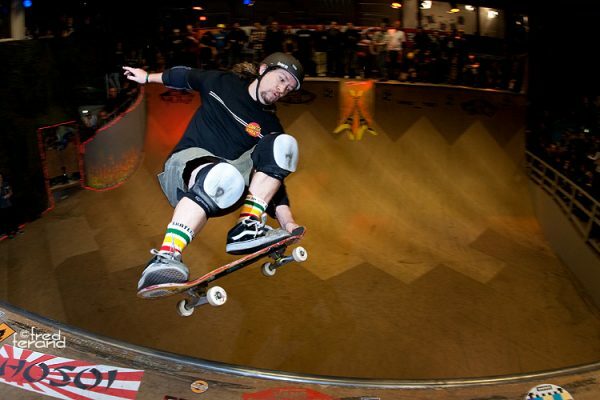 My expectations for the master heats had risen pretty high after I had become aware that there would be a reunion with legends like Cab, Hosoi, Anders and Ffej. 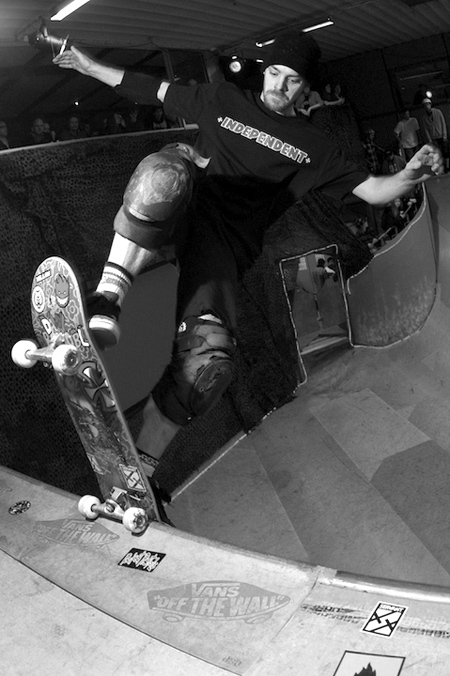 I’ve known Ffej since 1988 when he visited the first vert ramp I had built in my hometown of Bonn, Germany. 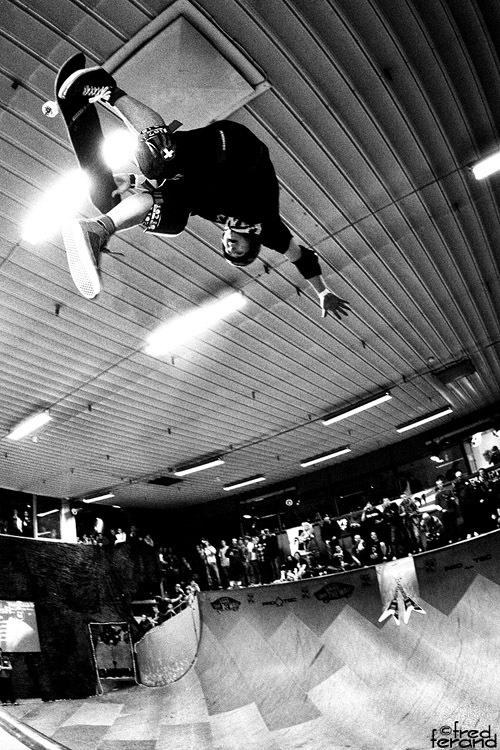 In that year he became World Champion of Vert Amateurs in Münster, taking out previous year’s winner Anders Tellen (“Pulpanek“). Now, 22.5 years later, they were put in the same heat again! With Cab and Hosoi, also the two winners of the pro division in 1988 entering the Masters of Vert Attack! 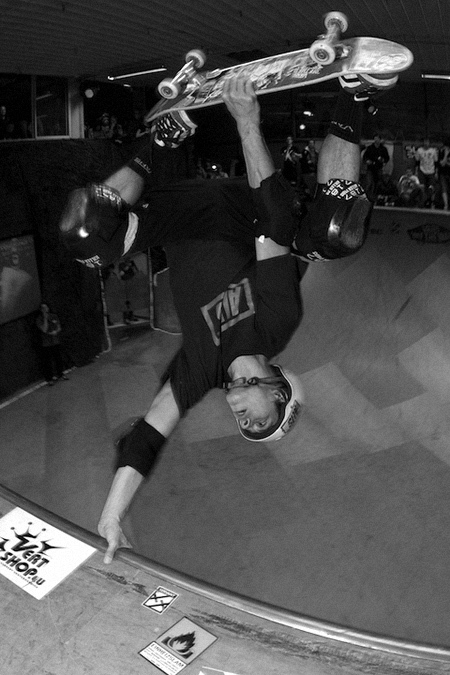 By the way: in 1988 Cab took first place in vert, Hosoi second, and Hosoi took first in street, where Cab took second! Ffej had won both Vert and Street Amateur! 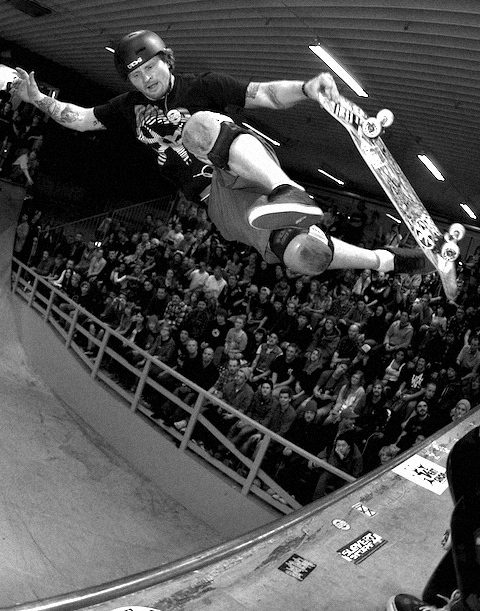 My emotions grew even stronger when I found out I was in one heat with Hosoi, having to skate right behind him! Would I have imagined this in 88?? 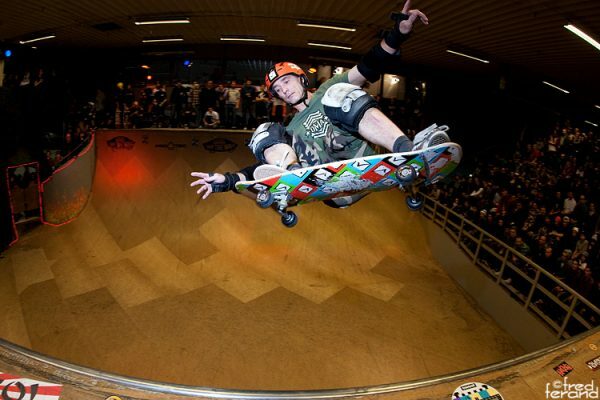 Hearing Hosoi talk in the well-prepared interviews by vert skaters Bjorn Handell (Malmö) and Robert Ayton (UK), there was no doubt Christian had changed a lot since then. 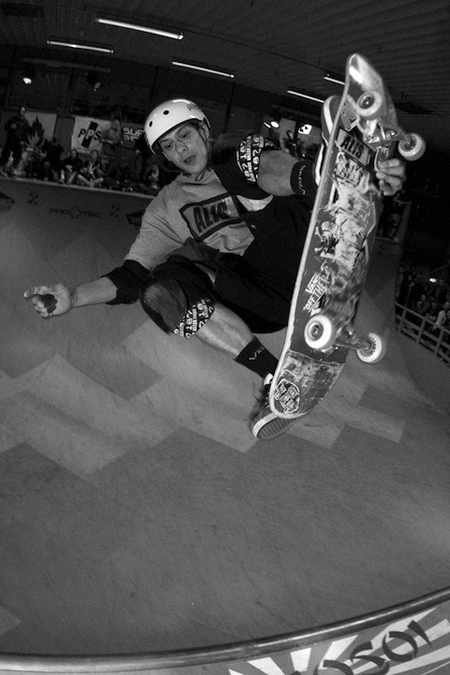 On the ramp it was still the old Hosoi: tons of style, highest unique airs and his characteristic pro allures. Such a pleasure to be able to witness this again after so many years. 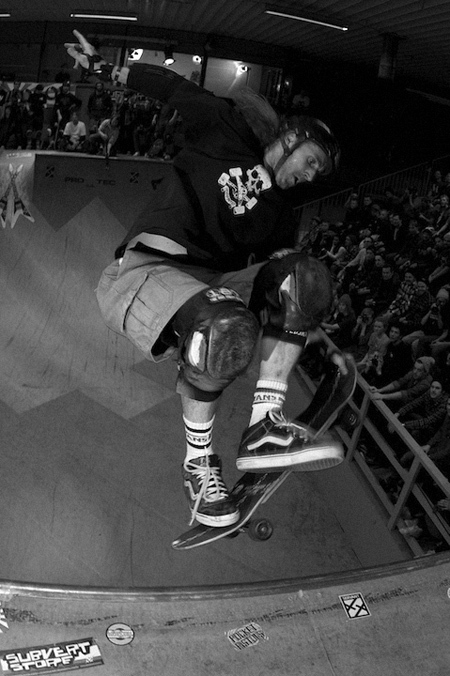 That Cab would also be ripping like hell was not that surprising – Cab has always been around. 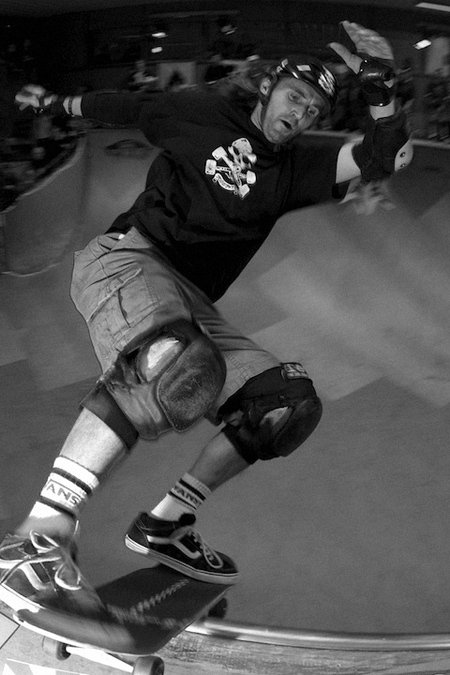 But seeing Jeff “ffeJ“ Hedges after his 15-years-riding-break almost made me shiver. It’s always a pleasure to see Sean Goff doing his never ending variety of rare tricks, with many foot and handplants and layback airs. Anders Tellen had such amazing runs he almost could have won the masters final. 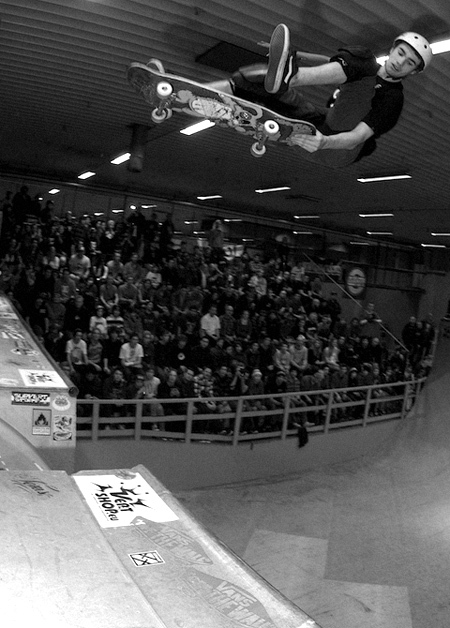 Tuck knee inverts to fakie, over the channel, high airs, aggressive style, endless runs… Anders will always remain a candidate for the masters’ podium, but missed it slightly this time. 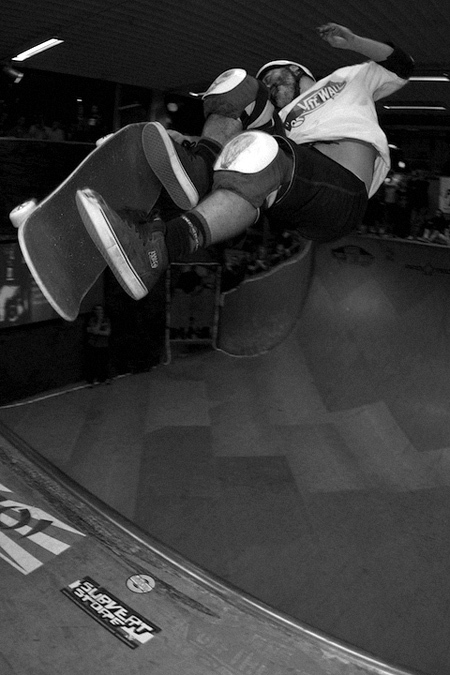 Hosoi launched himself into 3rd place with rocket airs and the highest backside air pulled in this final. Nicky Guerrero took second place. 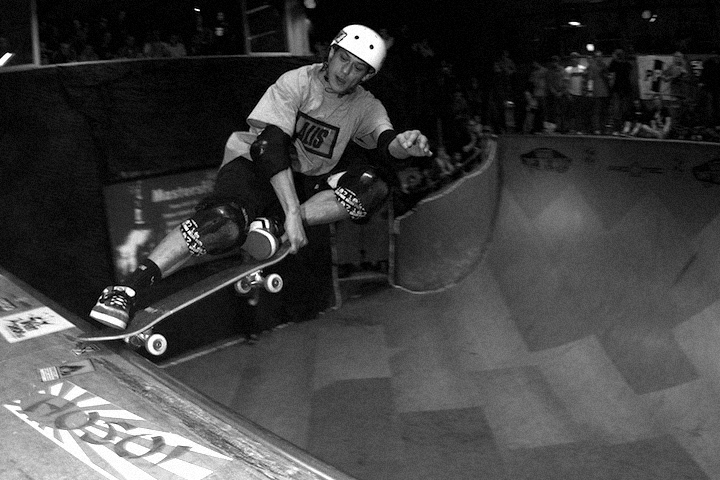 Now he skates even better than when he turned european champion frequently in the late 80s. 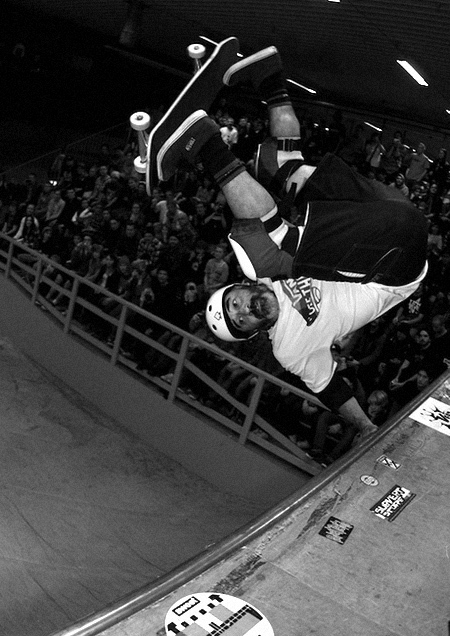 Steve Caballero really enjoyed the ramp (as most riders did!) and did the longest runs with a great mixture of all kinds of tricks. He took home the nicest trophy! “I think there is one thing that‘s been a key for success of Vert Attack…. Stan Postmus once again did a great job as the annual VERT ATTACK speaker. 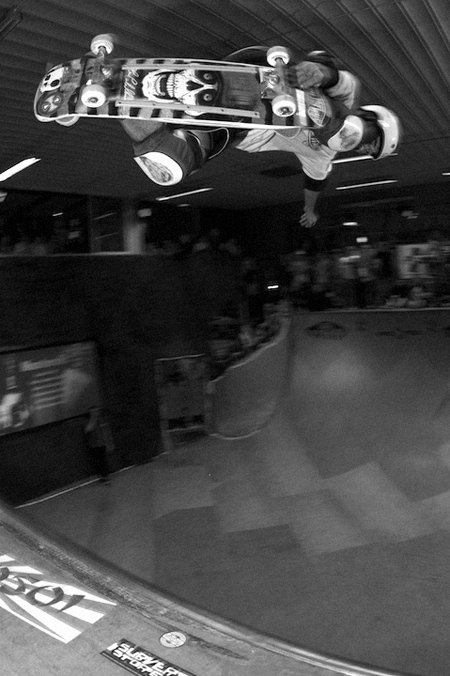 This dutch skater is already well known from the BOWLBASH series and many other skate comps. Tons of nice pictures! Thanks for posting! I am really impressed with your writing skills and also with the structure to your blog. Is this a paid subject matter or did you modify it yourself? Anyway stay up the nice quality writing, it’s uncommon to see a nice blog like this one today..
wow, thanks a lot, Haagissuvila! THis is all written voluntarily. At first I had put that article together for JUICE magazine, but Europe is not enough in their focus, it seams. So I was very happy Jay used it for confuzine and added awesome photos from himself and a good friend (Fred Ferand). CU at Ultrabowl this weekend!